What a Squash Irish Open we had this weekend. John Rooney former Irish Professional player from Galway won the men’s over 35 beating defending champion Keith Moran from Sligo, both pictured below. 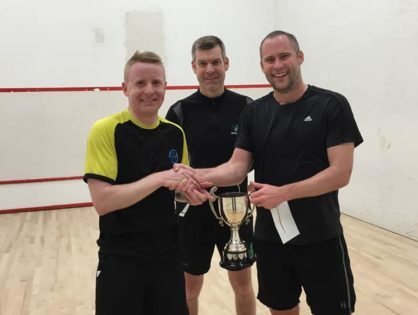 Neal Murphy from Nass successfully defended his over 40 title beating Dara O’Flynn from Fitzwilliam in Dublin 3-1 in the final. Well done to Sundays Well for hosting this prestigious Tournament and to Johnny Hurley as Tournament Director. Limerick Vets is now open for entry. South of Ireland Vets Tournament kindly sponsored by HLB McKeogh Gallagher Ryan April 26-28 2019. Online entry now open. Special Grade 5/6 Category.